ComplianceOnline, the leading GRC advisory network, and industry expert, Robert J. Russell, will conduct a two day seminar on the structure of regulatory agencies in Latin America. Course "Latin America: Regulatory Compliance Requirements for Life Science Products (Focus: Brazil, Mexico, Argentina)" has been pre-approved by RAPS as eligible for up to 12 credits towards a participant's RAC recertification upon full completion. 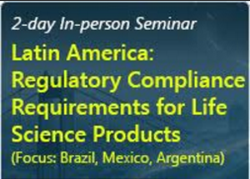 This interactive program on Latin America Regulatory compliance requirements will cover topics ranging from pre-clinical and clinical requirements through product registration, amendments and renewals across pharmaceuticals, biologic, medical devices and combination products. The course will address the structure of regulatory agencies in Latin America and discuss local cultural nuances for working with regulators. Speaker Robert J. Russell is president of RJR Consulting, Inc., a global regulatory consulting company, specializing in understanding regulatory issues for the pharmaceutical, medical device and combination products industry. Mr. Russell has more than 30 years of experience working with FDA, EMA, and other healthcare authorities and agencies across Latin America, Middle East and Asia/Pacific, supporting clients’ projects in these regions. Licensing, registrations, GMP, DMFs and borderline products are his core competencies. RJR's offices are located in every major region with in-country experts on staff handling local regulatory needs. The seminar will focus on the current regulatory climate in Latin America. Common issues that have caused difficulties for life sciences firms in the region will be outlined in the program, along with how Latin America interacts with and utilizes ICH standards and how they relate with other national healthcare authorities. Participants will learn how personnel can best address the conflicts, which arise and the best course for resolution. For more information or to register for the seminar, please register now. ComplianceOnline is a leading provider of regulatory compliance trainings for companies and professionals in regulated industries. ComplianceOnline has successfully trained over 35,000 professionals from 9,000 companies to comply with the requirements of regulatory agencies. ComplianceOnline is headquartered in Palo Alto, California and can be reached at http://www.complianceonline.com. ComplianceOnline is a MetricStream portal. MetricStream (http://www.metricstream.com) is a market leader in Enterprise-wide Governance, Risk, Compliance (GRC) and Quality Management Solutions for global corporations.